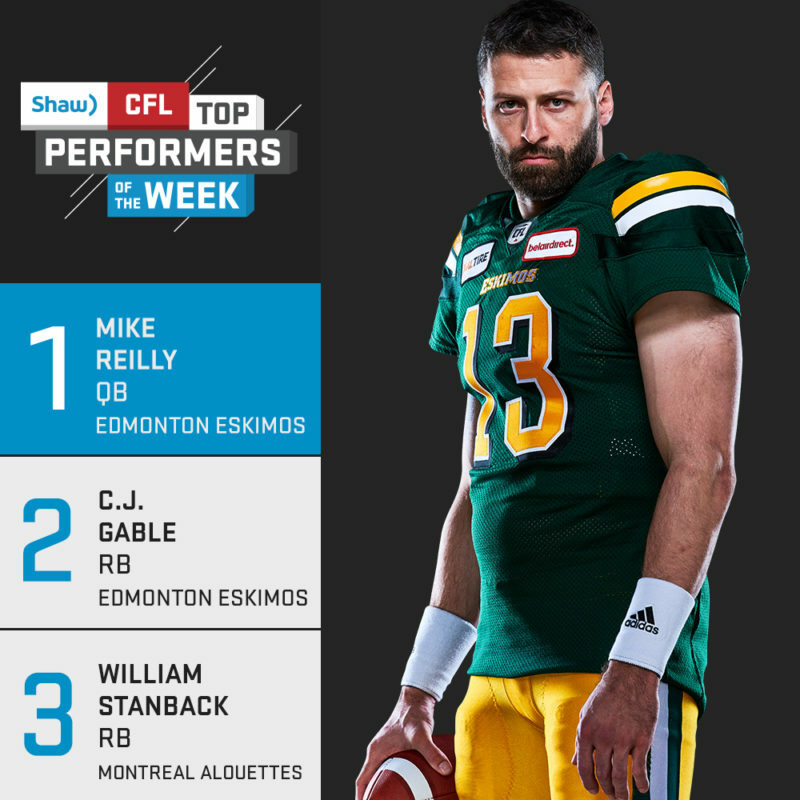 TORONTO — Mike Reilly, CJ Gable and William Stanback were named the Shaw CFL Top Performers of the Week for Week 21 of the CFL’s 2018 season. The three players were chosen by a panel of judges who independently send their selections to the CFL head office. The panel includes former Canadian Football League players Matt Dunigan and Duane Forde of TSN and Pierre Vercheval of RDS. Quarterback Mike Reilly led Edmonton to a home victory over the Winnipeg Blue Bombers to close the 2018 season. Reilly passed for 320 yards, going 29-for-35 and throwing for one touchdown. He also rushed for 41 yards. At the end of the first quarter, Reilly moved Edmonton 75 yards in nine plays, including a 17-yard touchdown pass to Duke Williams at the back of the end zone to establish an early lead. Twice in the game Reilly maneuvered Edmonton downfield before passing off the ball to teammate CJ Gable for touchdowns. He steered kicker Sean Whyte into position for four field goals over the course of the game, bringing Edmonton out on top. Reilly was a Shaw Top Performer of the Week for Weeks 2, 7, 10, 13 and 18; he was also a Shaw Top Performer of the Month for June and August. He leads all quarterbacks with 5, 562 yards, having reached 5000+ yards for the third consecutive year. He finishes the season with 30 touchdowns. 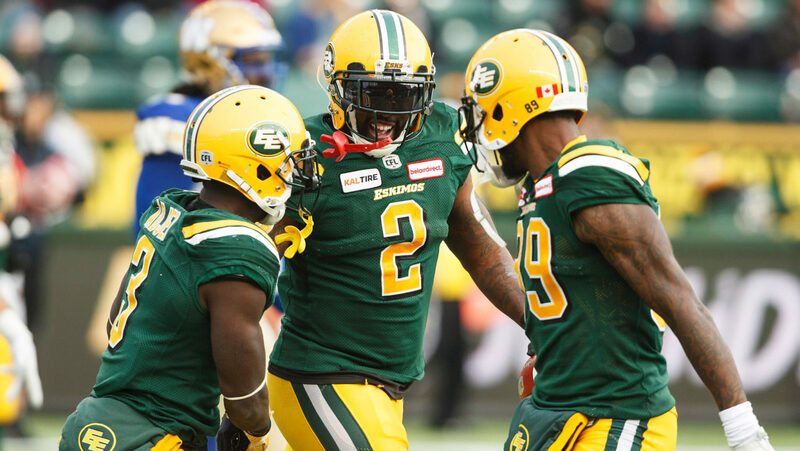 Running back CJ Gable ran in two touchdowns to propel Edmonton to a 33-24 win in their last regular season game of 2018. Gable collected 112 rushing yards on 18 carries. He also recorded 17 receiving yards on two receptions. Just minutes into the second quarter, Edmonton began a 76-yard drive. Gable ran for four of the drive’s eight plays, including a two-yard run for a touchdown. At the top of the fourth quarter, Gable had a huge run, dashing 27 yards for his second touchdown of the game. Gable was previously named a Shaw Top Performer of the Week in Week 3. He finished third in the rushing race with 1,362 yards, his first ever 1000+ yard rushing season. He also ranked third in carries with 196, and ended the season with seven touchdowns. 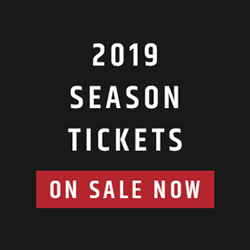 William Stanback helped the Montreal Alouettes end the season with back-to-back wins, ringing in a close 30-28 victory over the Hamilton Tiger-Cats on Saturday night. Stanback tallied 31 rushing yards on six carries, as well as 103 receiving yards on five receptions. The game was a career high in receiving yards for the CFL rookie. His biggest catch of the game came midway through the third quarter, a 59-yard play off a pass from Antonio Pipkin. Stanback had 539 rushing yards on 81 rushes this year, in addition to 313 receiving yards and two receiving touchdowns. SHAW FANS’ CHOICE OF THE WEEK! Matt Nichols won Week 20 of Shaw Fans’ Choice of the Week and collected 10 bonus points. The Shaw CFL Top Performers recognizes weekly and monthly player achievement in the CFL and is separate from our year end awards. Each week and month during the CFL Regular Season a panel of CFL experts vote on the three top CFL Performers across the league in order. Those players are awarded points for each time they win. Then we throw it out to you, the fans, to Retweet our Twitter posts announcing the winners. The player with the most Retweets will receive extra points and be crowned the Shaw Fan’s Choice of the Week. Remember, once the next Week begins voting ends; so get your RTs in fast! What is the scoring system? Here are the points for each award winner.